The ACC/Big 10 Challenge was back at Purcell Pavilion as Notre Dame (6-1) used a big run to beat Illinois (2-5) in a game of runs. Illinois had a chance to win but a Trent Frazier’s last-second three rimmed out to give the Irish the 76-74 win. Notre Dame reeled off a 17-2 run midway that included nine-straight stops on defense and gave the Irish a 65-52 lead. The 6-foot-11 junior scored six points and blocked two shots during the run, while a critical three-pointer from TJ Gibbs gave the Irish some much-needed momentum inside Purcell Pavilion. Gibbs finished with 19 points, four rebounds, and four assists, while Aaron Jordan led the Illini with 23 points and five rebounds. Durham ended the night with 10 points on 3-for-4 shooting from the field, four rebounds and five blocks. “I’m so proud of Juwan Durham. For him to come in and do that, he deserves it. It the midst of watching it, we’re up double-digits, and they make a run. I didn’t want us getting beat to spoil his coming out party. DJ Harvey, who scored 19 points to go with six rebounds, almost put the nail in the coffin with 6:25 left in the game with a three-pointer to push the Irish lead to 65-52 but the Illini had other plans. After Harvey’s three, the Illini ripped off a 12-2 run to make it a game in the end. 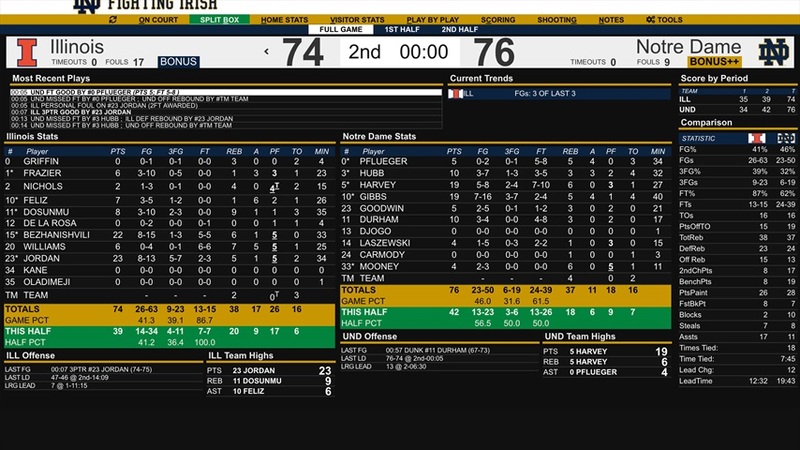 Durham ended the run with a dunk after the Irish broke the fiesty Illini press and added another block to give Notre Dame a 73-67 lead with under a minute left. What will be lost in Durham’s big performance was he stepped up when his team needed him the most. 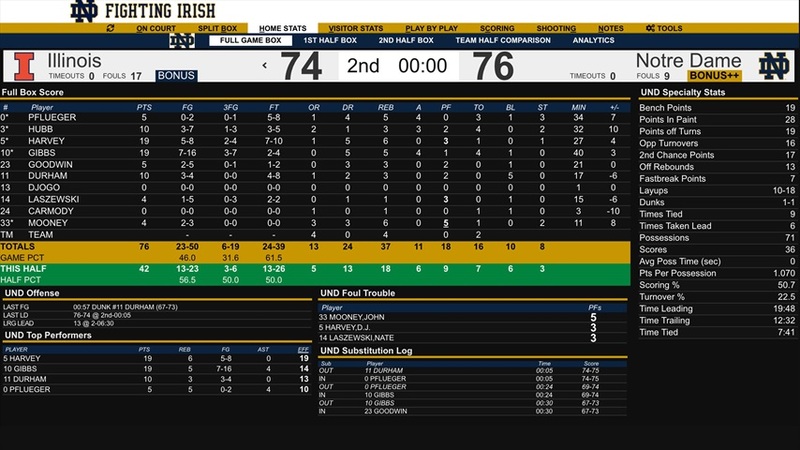 Notre Dame junior forward John Mooney fouled out with 16:50 left in the game and the Irish only had Durham and freshman Nate Laszewski to work the post. Brey believed it might have been the perfect recipe for Durham as he not only had to play but he matched up well with Illinois. “It was a maybe a good style to play against,” explained Brey. “There was a big guy to guard, and he could lay back in the hole. He changes stuff. I thought it was interesting to watch it develop before our own eyes. Our team got so confident in him they were throwing it to him in the post. That’s new. The Irish also continued to be efficient on the offensive end of the floor for the second game in a row. 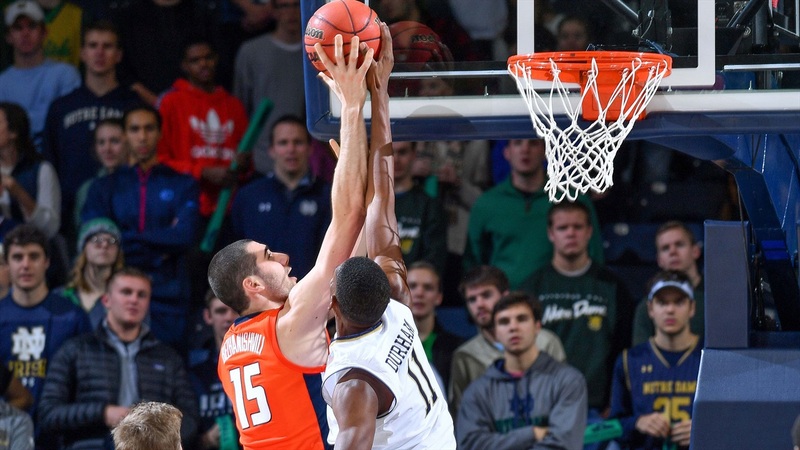 Notre Dame shot 46% from the field and converted 13 offensive rebounds into 17 second-chance points. Notre Dame freshman Robby Carmody did leave the game in the first half with another shoulder issue, but Brey is confident he’ll be ready to play on Tuesday.